It's a T-top compact SUV that is capable on rocky terrain. Oh, I get it. T-ROC. Heh. With the newly-unveiled Volkswagen T-ROC Concept, Das Auto has shown us die Zukunft of the SUV. And is it ever weird (in the best of all possible ways). The Volkswagen T-ROC Concept looks like the offspring of a torrid evening’s one-off affair between a Beetle and a Juke. However, this love child seems to have more than a few unique tricks up its sleeve that set it apart from anything VW has to offer—including its Tiguan and Touareg SUVs. The three driving modes are also quite unique: “Street” mode is all-wheel drive where power is only distributed to the rear axle when necessary; “Offroad” has push-button optimization, begins with 50:50 front/rear power distribution, and utilizes hill descent assist, hill start assist, gear preselection, and ABSplus; “Snow” mode also has a default 50:50 distribution with ABsplus, and the parameter maps for both engine and gearbox are modified to account for low traction. In short: it’s a T-top SUV that is capable of handling ROCky terrain, hence the name T-ROC. Well, at least that’s not terribly nebulous. 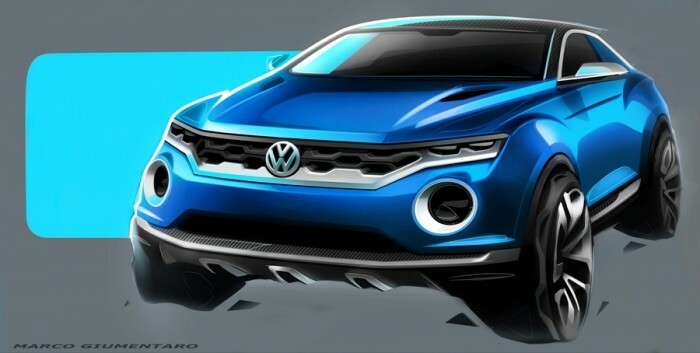 The Volkswagen T-ROC Concept will debut at Geneva next week. Until then, let’s hear your take: is this the future of compact SUVs or just another flashy concept that won’t go anywhere?